The post war construction boom created significant demand for construction materials and unprecedented opportunities for the HK mining industry. One of the handful of tenacious capitalists who participated in this labor and capital intensive, heavily regulated yet risky trade was Ko Ming-fan, who operated the Flat Hill stone quarry in Ngau Tau Kok from 1956 to 1976 and the kaolin mine in Cha Kwo Ling from 1978 to 1990. 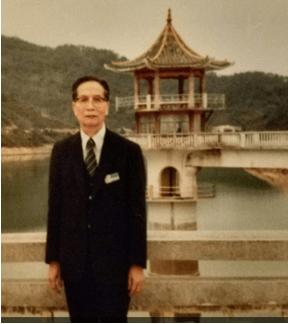 A Hakka native who came to Hong Kong in 1946, Ko was a self-made entrepreneur whom according to his former daughter in law started out as a pushcart peddler and was involved in the garment industry. He entered the mining business when he acquired the Flat Hill Quarry Co Ltd in 1956 and operated its stone quarry in Ping Shan (Flat Hill in Chinese) in Ngau Tau Kok under an annual license for 17 years. The 1950s and 1960s were golden years for the HK mining industry as construction took off and Ko made a fortune which enabled him to purchase a home in 5 Cambridge Road in Kowloon Tong and a factory building in Tsui Fung Street in Wong Tai Sin. In 1960, the Flat Hill Quarry Co entered into partnership with the Evangelical Lutheran Church which had engaged them to help blast a hillside site in Shau Kei Wan to build a school and in return Flat Hill gets the stones. When construction was suspended in 1962, Flat Hill Quarry sued the church in 1965 for damages and won. In 1974, Flat Hill Quarry’s blasting operations in Ping Shan was suspended by the government. It continued to crush stones from elsewhere for two years until it was ordered to vacate the premise in 1976. The same year, Ko acquired a kaolin mine in Tuen Mun but only operated it for 2 years as the government refused to renew the license for that site in 1978. As a company, Flat Hill Quarry Co Ltd was incorporated in 1959 and dissolved in 1995. The Flat Hill Quarry site was re-developed into public housing estates (Choi Ying, Choi Ha, Choi Fook and Choi Tak) in recent years. Not one to give up, the 72 years old Ko acquired the HK Clays & Kaolin Co Ltd in 1978 from Wu Won-hoi, who bought it from Jardine Matheson which in turn acquired it from the McBain family from Shanghai which was covered in a separate article earlier on the website.HK Clays was the operator of the clay and kaolin mine in Cha Kwo Ling which had been mined since 1933. 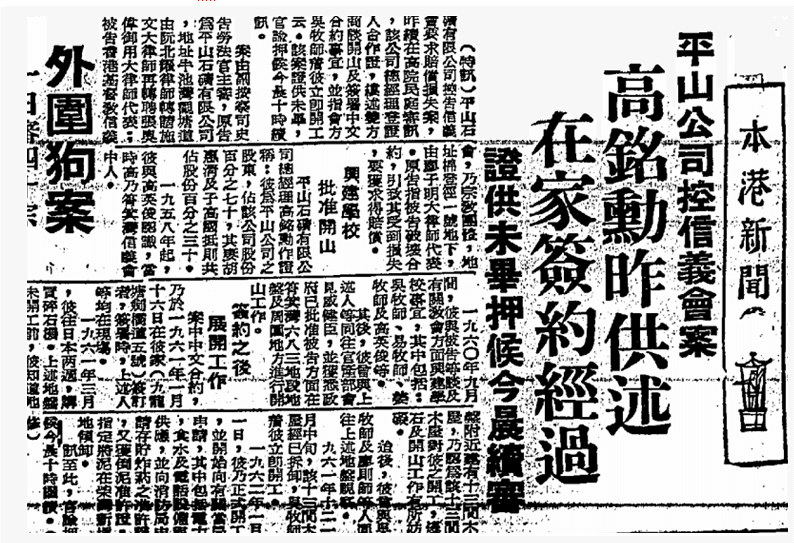 Wu lacked the blasting resources to make the mine economically viable which was where Ko came in. Some of Flat Hill’s trucks and equipment were transferred to the Cha Kwo Ling mine and production became more industrialized which was not welcome by the adjacent Cha Kwo Ling village. With Ko in the picture, the mining lease of the Cha Kwok Ling mine which expired in 1980 was renewed until 1990 after he paid a premium payment of $6.3 million. A tile factory was built at the adjacent site in 1986 but unfortunately competition from countries such as Italy was tough as the Italian lire depreciated. The mine was largely unprofitable and lost money for most of the 1980s except for 1988 when it recorded a modest profit of $485,000 and ended the decade with accumulated deficit of $13.2 million and total liabilities of $49 million including $20.7 million from the Ko family. Ko had 10 children with his second wife, several of whom worked for HK Clays including fourth child Ko Kwok-kue who joined in 1973, fifth child Cynthia Ko So-fun who worked there from 1981-88 and sixth child Ko Kwok-tung (Kearn), who worked for HK Clays as a director and lived with his family on site from 1978 until 1983 when he was injured in an accident at the mine. In December 1990, Ko Ming-fan immigrated to Canada, where he lived to the age of 106 and died only a few years ago in Vancouver in 2012. As for the Cha Kwo Ling mine, the lease was renewed by the government in 1991 but not renewed in 1996 and as a result, the mining operations ceased. In November 2016, Wheelock Properties outbid 11 contenders and won the land sale tender to re-develop part of the former Cha Kwo Ling kaolin mine site into a residential development for a total consideration of HK$6.4 bil. This article was first posted on 30th April 2018. Q+A 40 Flat Hill Quarry? Four Hills Elementary School, Cha Kwo Ling – Four Kowloon quarries?